WE ARE KEEPING A LIST OF NAMES. PLEASE CALL OR EMAIL SO WE CAN PUT YOU ON OUR LIST. 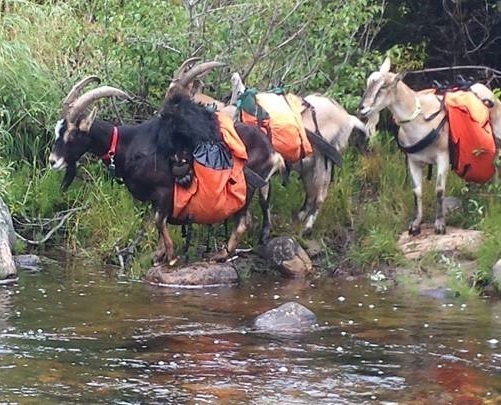 WE ARE NOT TAKING PACK GOAT DEPOSITS AT THIS TIME. WE ARE KEEPING A LIST OF NAMES. PLEASE CALL OR EMAIL SO WE CAN PUT YOU ON OUR LIST. 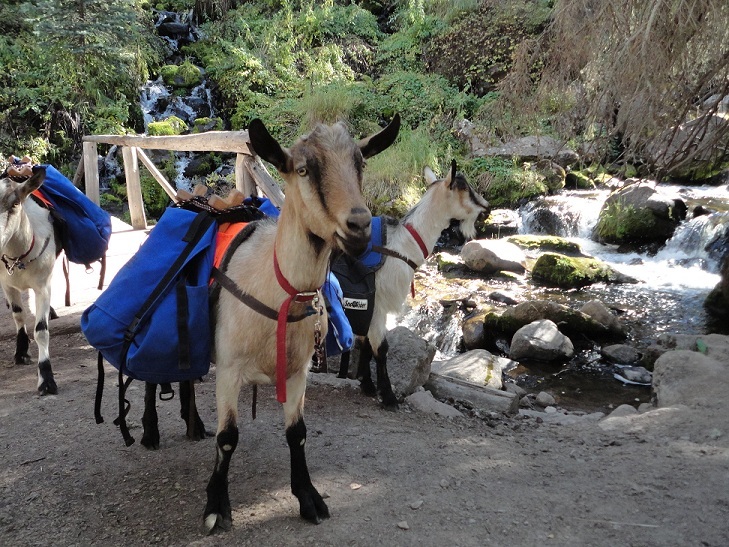 We have been selling pack goats for 15 years and have decided it was time for a page on our web site. I viewed a few pack goat sites and realized some important factors that some other sites don’t bring to your attention. 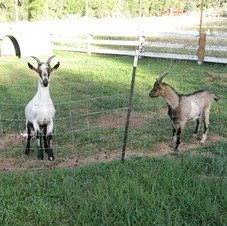 Our registered goats are appraised and judged by American Dairy Goat Association (ADGA) licensed professionals. 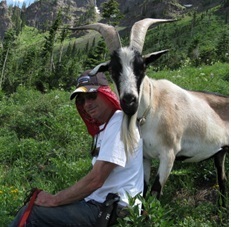 ADGA has established an Alpine breed standard that we are trying to meet. 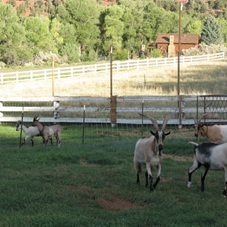 The pack goat industry has not yet developed a breed standard. I feel this is a huge advantage for us. 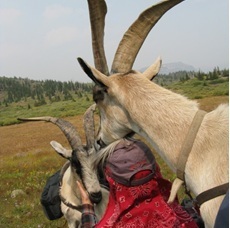 It is my understanding that size is emphasized and seems to be the most important factor in the pack goat industry. Even though we have some of the largest Alpines, we’d like to bring other factors to your attention. We breed for strong feet and legs in our does and our bucks. We strive to have a strong front-end assembly, width in the loin and back and thou out, tight toes, deep hills, strong pasterns, length & depth of body and an overall tall, angulated upstanding animal. 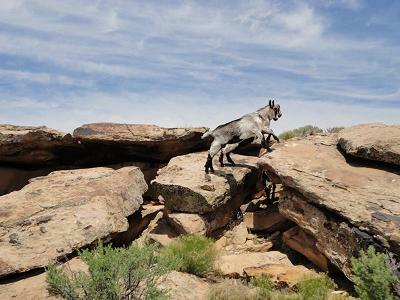 The Alpine breed has a history of weak pasterns, toeing out and front-ends that are too far forward. We are still working on breeding these traits out. Your kid may have picked up these traits. ADGA has a program called Linear Appraisal. Even though it is a dairy program, you can use this program to evaluate the dam & sire of your kid. You can get individual numbers on, stature, strength, rump angle, and rump width and rear leg angulation. You can get the individual ratings on head, shoulder assembly, front & rear legs, feet, back & rump. You have to get the actual height & width numbers in inches from us. We have a CAE & brucellosis free herd. We raise our kids on the dam for 4 weeks and then train them to a bottle and bottle feed pasteurized milk until weaned, usually around 10 weeks of age. From our past experience, kids raised on heat-treated colostrum don’t have as strong an immune system as one raised on mom’s unmolested milk. Leaving the kids with mom gives them a better start. Mammas need their babies and the babies need their mammas. We have found the kids to have much more size with this method. By the end of 10 weeks we have a friendly healthy kid. You are welcome to take your kid at 6 weeks of age and bottle-feed him for 4 more weeks or longer. We will provide the milk for this as long as we have the milk. 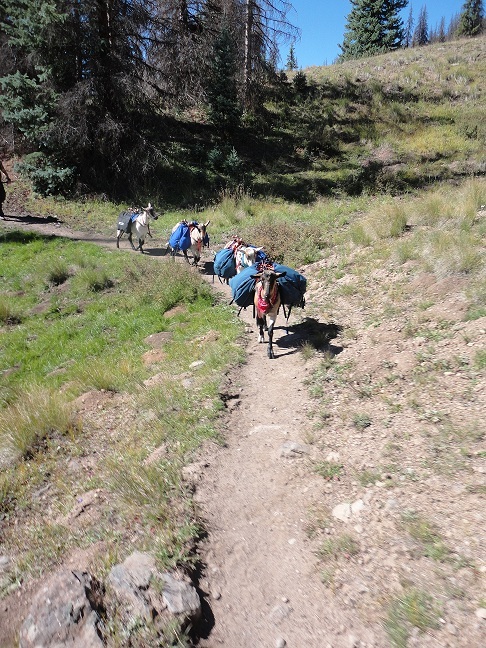 Another advantage our kids have is altitude. 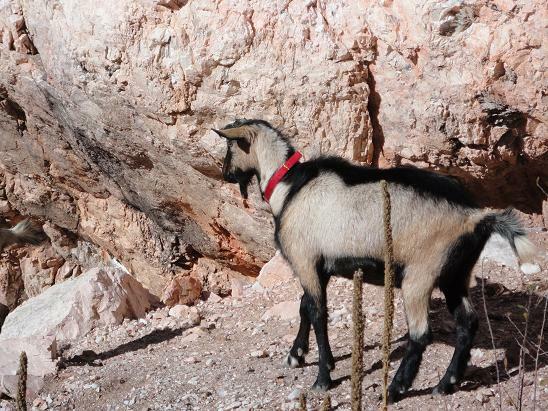 Our goats live at 6,800 ft. 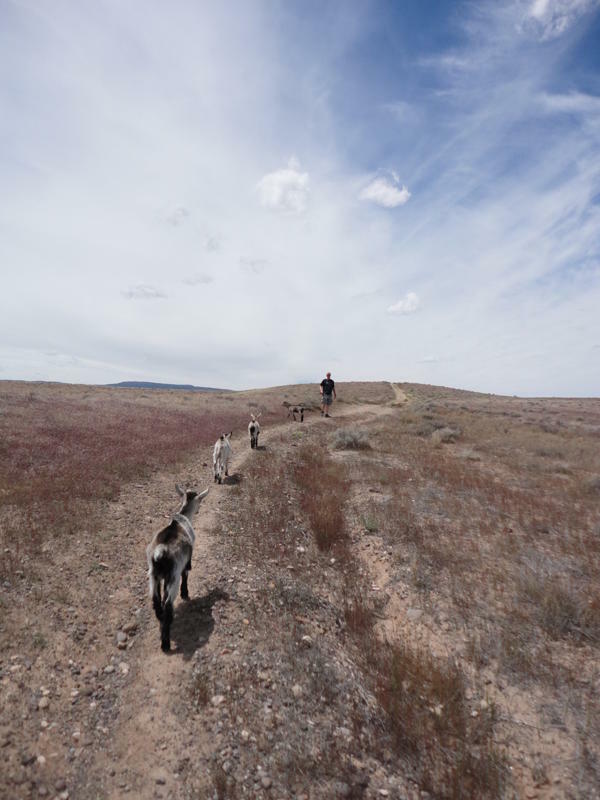 When you get a pack goat from us, he’s already acclimated to the high elevation. 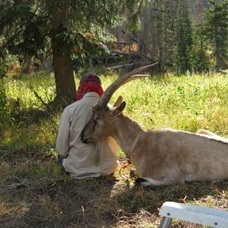 He will adjust well to your new home if you live below 6800 feet. Respiratory issues are less likely, then if you buy a kid from a lower elevation. Because most customers don’t want their buck kids castrated, we do not castrate ordered pack goats, unless requested by the buyer. It is industry practice to castrate from 6 to 8 months of age. We dehorn all kids, unless otherwise requested by the buyer. We will leave the horns on if the kid is paid for in full by 8 days of age. We do not have a place to keep older kids with horns. We will also tattoo your kid upon request. This is a permanent form of identification. The Alpine is number one for packing. They are intelligent and have more endurance then many of the other breeds. 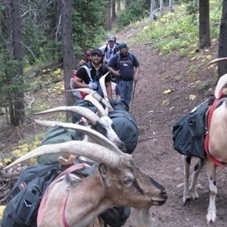 We will work with you to help you get the pack goat family you have always wanted. Thank you for your interest in our herd. 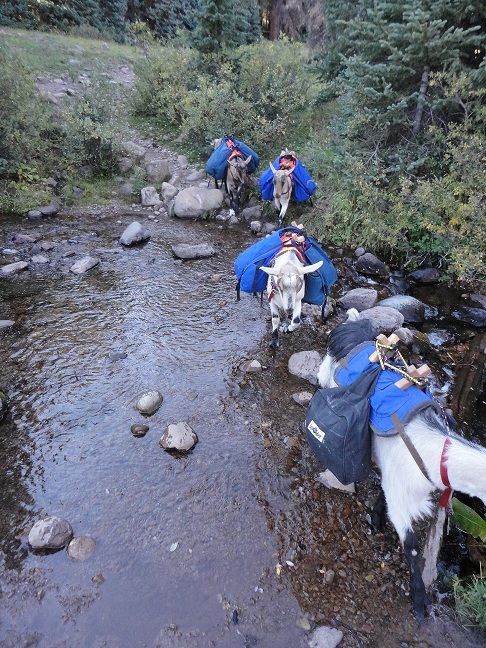 The goats are measured from the ground to the top of the withers. Buck height is listed on individual pages.